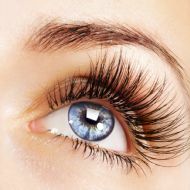 Eyelash extensions are the amazing beauty treatment that gives you thicker, longer and natural looking lashes. Individual synthetic lashes are applied to your own natural lashes in a way that will not damage your own lashes and allows the natural growth pattern of your own lashes to continue. When correctly applied your lashes should feel comfortable and lightweight and you will not know that you are wearing them. The treatment should be pain-free and relaxing, with most clients falling asleep. Our eyelash extensions don't look false - they look like the real thing. A variety of looks can be achieved, from a very natural daytime look to a more dramatic evening effect. We carefully custom and apply our eyelashes to suit individual clients eye and face shape. However, as we use your natural lashes we will only apply what we can safely achieve on them - If you are blessed with a good set of strong natural lashes then we can achieve a fuller look. Whereas if lashes are naturally sparse then we can achieve a more enhanced natural look, as we will never overload your natural lashes or cause damage. We will discuss the look we can achieve at your client consultation. We apply extensions to each suitable carefully isolated eyelash. And as the average person has 60 - 100 lashes, it can take anything from 1 to 2 hours to apply a full set of extensions. Maintenance infills usually take anything from 1 hour to 1 hour 30 minutes. Our natural not only grow daily but they also shed daily, with the average person losing 2-5 natural lashes in each eye, per day. They can last up to 3 weeks. If you want to maintain your extensions and keep them looking their best, you'll require infills approximately every 2-3 weeks. If you choose to have your set for a one-off special they will fall out naturally over the course of 3-6 weeks. They are easy to maintain, but you do have to treat them with a little care and clean and brush them regularly with special brushes. You can still wear eye makeup, but you must not apply mascara to the extensions or use any form of liquid or gel eyeliner to the upper eyelid. Mascara and eyeliner cannot be cleaned from the extensions without damage and will cause the glue to break down and the lashes to stick together. You can't have infills applied to lashes with mascara or eyeliner. This will require a complete removal and the application of a full set of new eyelashes.